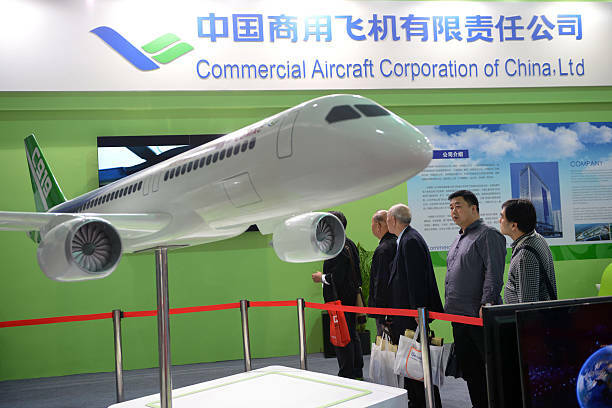 Commercial Aircraft Corp. of China Ltd., or Comac, is part of China’s bid to build an aerospace industry from scratch -- and gain more international clout. But so far, its orders have mostly been limited to domestic buyers such as China’s state-owned carriers and HNA. “Our Chinese shareholders are very keen to introduce the aircraft to boost China-Africa trade relations,” said Quan. Comac executives will be in Ghana’s capital Accra, where AWA is based, in late March to possibly sign a memorandum of understanding with the airline, he said. A Comac representative said the company isn’t aware of any imminent ARJ21 order from AWA but referred to an earlier agreement with HNA that the Chinese conglomerate plans to operate 100 of the planes in the future. HNA couldn’t immediately comment. Chinese President Xi Jinping’s government, as part of his Belt & Road Initiative, has been helping African governments build airports and other infrastructure. Offering low-cost Chinese-made planes is part of that strategy, said Shukor Yusof, founder of aviation consultancy Endau Analytics in Malaysia. “It serves the purpose of enlarging Chinese political influence,” he said. “The Chinese are trying to create a market for themselves. 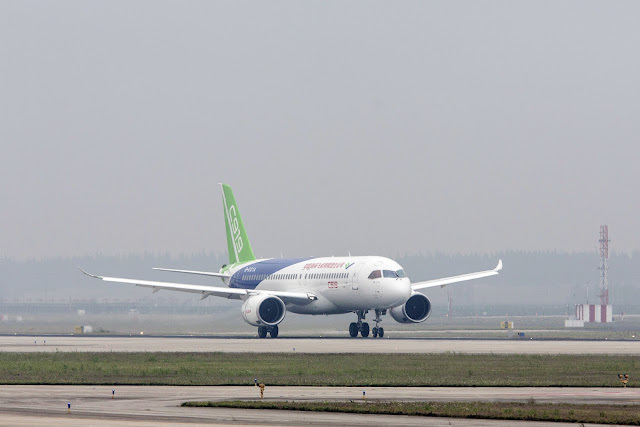 Chinese C919 aeroplane will compete with Boeing 737 Max and Airbus A320. Photo: Qilai Shen. Comac is also building the C919, a narrow-body passenger plane that will compete with Boeing’s 737 Max and the Airbus A320neo. Any African breakthrough would come as Boeing grapples with the worldwide grounding of the Max, the company’s fastest-selling plane, after two disasters involving the model in five months. China is pushing for jetliner orders from a number of other African countries. “Of course they have approached us,” Air Tanzania Co. CEO Ladislaus Matindi said in an interview last month. “The Chinese come with sweeteners,” he added, without giving details. He said the airline currently has no plans to buy Chinese planes. Chinese planemaker Comac is nearing an order from an airline in Ghana, a rare advance overseas for the state-owned company as it attempts to become a real challenger to Boeing Co. and Airbus SE. Africa World Airlines Ltd., partly owned by China’s HNA Group Co. may agree this month to buy two Comac ARJ21 regional jets, the carrier’s chief executive officer, John Quan, said in an interview. Ethiopia’s ambassador to China, Teshome Toga Chanaka, on March 17 posted a photo of himself in a Comac plane at an airshow in Shanghai. “It will not be so long that we will see them in the blue sky,” the ambassador wrote on Twitter. The Boeing 737, with 157 people on board was en route to Nairobi, Kenya from Addis Ababa. An Ethiopian Airlines flight carrying at least 150 people crashed early Sunday shortly after departing from the Ethiopian capital, Addis Ababa, en route to Nairobi, Kenya, the airline said, killing everyone onboard. 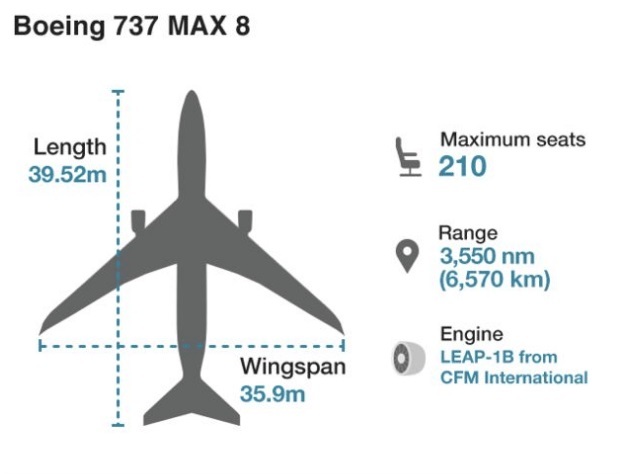 The plane was identified by its manufacturer, Boeing, as one of its newest models, a 737 Max 8. The cause of the crash was unclear, but a Lion Air flight using the same model of plane went down in Indonesia in October and killed 189 people. Officials are investigating whether changes to the Max 8’s automatic controls might have sent that flight into an unrecoverable nose-dive. The airline said Flight 302 was carrying passengers from at least 35 countries. The dead included 32 Kenyans, 18 Canadians, nine Ethiopians, eight each from the United States, China, and Italy, and seven each from France and Britain, the airline said. The flight on Sunday took off from Bole International Airport in Addis Ababa at 8:38 a.m. local time and lost contact six minutes later, the airline said. 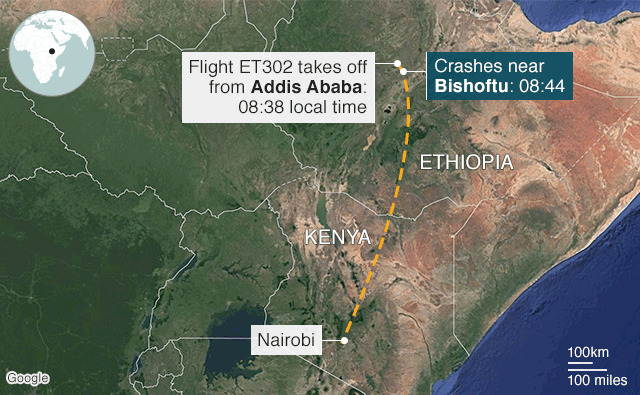 The plane went down near Bishoftu, about 35 miles southeast of Addis Ababa. Tewolde GebreMariam, the chief executive officer of Ethiopian Airlines, said at a news conference that the pilot had sought and had been given clearance to return to the airport in Addis Ababa after reporting difficulties. 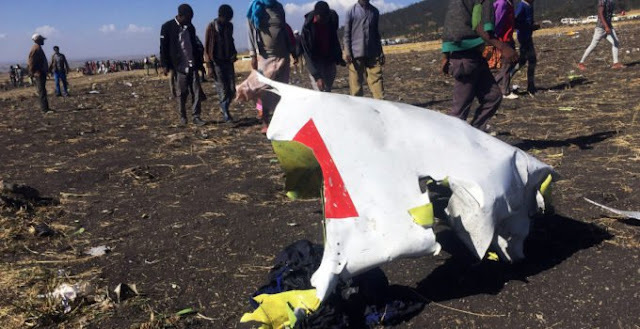 Mr. GebreMariam said that it was too early to determine a cause or rule anything out, adding that a team from the National Transportation Safety Board in the United States would be arriving shortly to work with civil aviation authorities in Ethiopia and officials from Boeing. The N.T.S.B. said that it would be sending a four-person team. The Federal Aviation Administration said in a statement, “We are in contact with the State Department and plan to join the N.T.S.B. in its assistance with Ethiopian civil aviation authorities to investigate the crash.” Relatives anxiously waited for news, as journalists from around the world descended on Jomo Kenyatta International Airport in Nairobi. There has not been a crash involving Ethiopian Airlines since January 2010, when a Boeing 737 crashed into the Mediterranean Sea shortly after it took off from Beirut, Lebanon. None of the 90 people on board that flight — 82 passengers and eight crew members — survived. The latest known accident involving the airline was in January 2015, when a Boeing 737-400 cargo aircraft veered off the runway with flat tires after it landed in Accra, Ghana. None of the three crew members on board were injured. The Lion Air Max 8 in Indonesia was a brand-new plane, like Ethiopian Airlines Flight 302, which was delivered to the African carrier late last year, according to websites that track commercial fleet updates. The flight took off in good weather, but the vertical speed of Flight 302 had been unstable after takeoff, fluctuating between positive and negative values, according to data published by FlightRadar24 on Twitter. In the first three minutes of flight, the speed varied from 0 knots to 1,472 to minus 1,920 — unusual during ascent. “During takeoff, one would expect sustained positive vertical speed indications,” Ian Petchenik, a spokesman for FlightRadar24, said in an email on Sunday. Crashes involving new planes in good weather are rare. The Lion Air accident also involved a plane that crashed minutes after takeoff and after the crew requested permission to return to the airport. Investigations by the Indonesian and American aviation authorities have determined that the Lion Air plane’s abrupt nose-dive may have been caused by updated Boeing software that is meant to prevent a stall but that can send the plane into a fatal descent if the altitude and angle information being fed into the computer system is incorrect. The change in the flight control system, which can override manual motions in the Max model, was not explained to pilots, according to some pilots’ unions. Global alerts were sent to notify pilots flying the Max about how to counter the anti-stall system. Ethiopia, with about 100 million people, is the second-most populous nation in Africa. After elections in March, the new prime minister has embarked on a series of political reforms, chiefly to officially end two decades of hostilities with neighboring Eritrea, a longtime rival. The country’s flagship carrier has undergone a major expansion in past years, more than doubling its staff to 11,000 employees in the past decade, with the goal of easing air travel in a part of the world where flying is notoriously complicated. 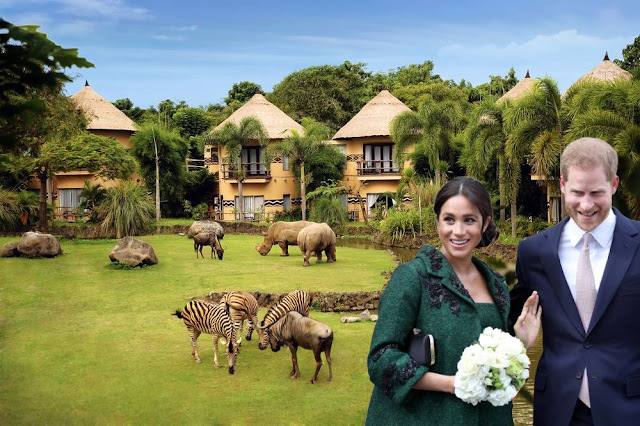 For instance, it added nonstop flights from Newark to Lomé, Togo, a hub for the airline, that then continued on to Addis Ababa. In West Africa, Ethiopian is the technical and strategic partner for a relatively new airline, Asky, created with investment from the Economic Community of West African States. Asky offers a web of cross-border flights in West and Central Africa and connects with Ethiopian flights to expand its reach across the continent and beyond. In Africa, Ethiopian has a reputation for having a newer fleet than other airlines, for operating flights that are mostly on time and for having accommodating schedules. The airline has ordered 30 Boeing 737 Max jets, with the first being delivered last year. It currently has five of the models in its fleet, according to FlightRadar24. Know This popular passenger jet was recently involved in the Lion Air fatal crash. If you’re worried about flying one on your next trip, here is a quick guide to the plane and the airlines that fly it. Boeing employees celebrate the first Max 7 coming off the production line in Renton, Wash. Since its introduction in 2017, the 737 Max series of planes has been bought by dozens of airlines. Since its introduction in 2017, the 737 Max series of planes has been bought by dozens of airlines. The investigation into the crash is still ongoing, and investigators have not made any announcements saying there are problems with the entire fleet of Maxes. But until the investigation is fully concluded, some passengers may still be nervous. Here’s some basic information about the Max and tips on how to find out if you’re scheduled to travel on one on your next trip. What is the Boeing 737, Max? It’s the latest generation of the Boeing 737, a kind of aircraft that’s been flying since the 1960s. There are four kinds of Maxes in the fleet, numbered 7, 8, 9 and 10. The 8 series, which was involved in the crash in Indonesia, has been flying the longest; the first one entered service in May of 2017. Max 9s are also now flying passengers, but the 7s and 10s are still in development phases.